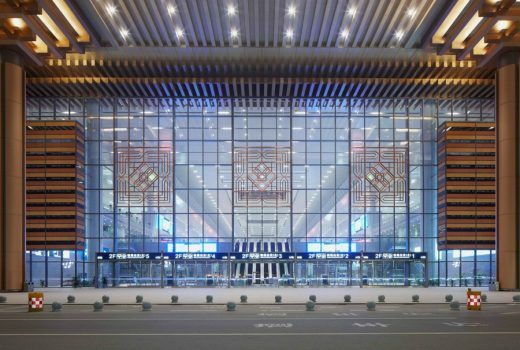 1)	Integration of Regional Characteristics of the City Reflection in culture and regionalism for the architectural scheme has been always the main line of the design for the design bidding of Nanjing South Railway Station. It extracts and integrates space elements reflecting regional characteristics and city style of Nanjing in combination with urban space characteristics of “Mountains Rivers Cities Forests” and “Ancient cultural city” of Nanjing to form an innovative architectural image with unique style and profound meanings. 2) Grasp the Design of Largest High Speed Railway Station in Asia from the Scale of Humanity We have attempted to blend more essences of traditional cultures and regional characteristics of Nanjing city comprehensively in the design of Nanjing South Railway Station and try to experience space shock and different and extraordinary spiritual feelings brought by transportation building with super-large volume from the perspective of users, namely each “person” in order to add new time classic for this ancient capital of six dynasties with about 2,470 years of history. 1)	Echo Urban Axis Relation The design work for buildings of Nanjing South Railway Station launched at the end of 2006, adopting the technique of urban design by conducting active exploration from the perspective of fully reflecting urban regional cultural characteristics. The project base is located in the main development axis of southern and northern parts of Nanjing city, namely: on the axis of Zhonghua Gate—Rain Flower Terrace—Nanjing South Railway Station—Qin Huai River, which is not only an economic axis expanded to the south of the city, but also an axis of historical and cultural landscape connected with humanistic attractions. Therefore, the designing scheme especially emphasizes the upright, solemn and axisymmetric features of architectural image to make the building correspond to the inherent spirit of urban axis. 2)	Integration of Traditional Architectural Elements We attempt to blend more essences of traditional cultures and regional characteristics of Nanjing comprehensively in the design of Nanjing South Railway Station, and to experience space shock and different using feelings brought by transportation building with super-large volume from the users’ perspective. These ideas and respect for local historical contexts are included in the whole designing process by integrating these traditional architectural images including dual eaves, colonnade, dougong, brick and paper-cuts for window decoration into the scheme to strive to bring a new time classic and city logo for Nanjing with long history—an ancient capital of six dynasties. Nanjing South Railway Station is the most significant station in the line of Beijing-Shanghai express railway located in the core position and it is also the largest high speed railway station in Asia. The Ministry of Railway called for bids for the design competition of the newly built Nanjing South Railway Station was conducted in the way of international schemes collection. The design scheme has obtained full recognition of experts participated in the meeting in the evaluation and won the bidding at last. Duration: 2006 to 2012 Project located in the place among the south of Nanjing downtown, Jiangning development area and new district of Dongshan which is about 10.5 km away from the downtown of Nanjing. 1)	Functional Layout of “Public Transport Priority” and “Separation of Pedestrians and Vehicles” The functional layout of station buildings has innovatively adopted the three-dimensional streamline mode in combination with “entering at top and leaving at bottom” and “entering at bottom and leaving at bottom” to fully reflect the design idea of “public transport priority” and “separation of pedestrians and vehicles” by abiding by principles of “focus on flow, separation of arrival and departure and transparent between south and north”. Reasonable organization for in station transport has been conducted to make transfer among railway passenger station, metro, long distance bus and social vehicles smoothly and make seamless tranship possible to make stations closely cooperate with urban functions of the region. 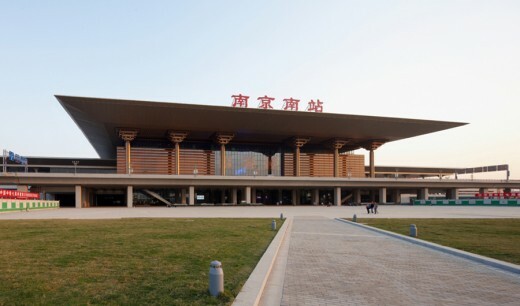 2)	Structural Morphology Presents the Form Intention of China Wooden Structural System The roof of main station building has adopted the form of tiering and narrowing by three layers, and the central part has set up roof light by combining three sets of indoor light tubes. Outside of curtain of station buildings in the south and north have a row of outdoor columniations that combined with far-reaching cornice with oblique projection to form a solemn and lofty eaves gallery space with strong sense of ritual. Bearing of roof truss systems is completed formed by beams in traditional construction methods of Chinese architectures. 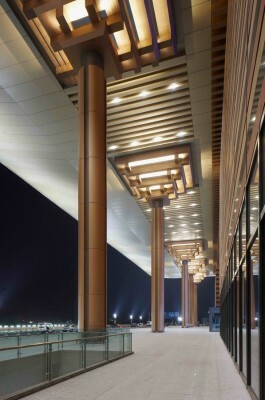 The combination of beams and Dougong with functions of cantilever support structure in this composite structure has formed the most innovative and representative Dougong structural system of Chinese wooden architectural art. We have restored the stressing form of the simplest superposed cantilever of original image of Dougong in the chapiter part connecting outdoor columniation with roof. It adopted box girder with steel structure through mechanics analysis and computational experiment for Dougong nodes. Transmission components of steel structure with composite cantilever have been constructed between combined steel and concrete column and steel truss roof to make the form of reinforced components of wooden structure change into the reinforced components complying with modern structural system. Braced force of scape homogeneously diffused to roof net rack system through the transmission of superposed girders. The roofing of Nanjing South Railway Station is about 94,032.8 m2, which is close to the size of the whole football field and one of the largest single roofing. What is more, the roofing has been installed with photovoltaic battery module with effects of energy-saving and environmental protection. The hollowing of the top of chapiter formed light well. Daylight cascaded off the cone light well hassketched clear structure of Doudong and also brought mystery and joy for solemn eaves gallery space through the gaps of superposed structures of chapiters. Details processing for the roof conformes to superposed Dougong in formal logic and constructed a complete form intention of Chinese wooden structural system. The buildings of Nanjing South Railway Station of Beijing-Shanghai express railway is located in the place among the south of Nanjing downtown, Jiangning development area and new district of Dongshan which is about 10.5 km away from the downtown of Nanjing. The total floorage of the station is 0.458 million m2 and floorage of main building of the station is 0.2815 million m2. The architectural scale and spatial scale is vast. The buildings of the station have accommodated various transportation systems including railway, metro, public transportation, taxis and long distance bus. As the layouts of all the function divisions are reasonable and streamline relations are clear and smooth, the project will become a new city centre of the ancient Nanjing city, and will also become the era sign of the city. 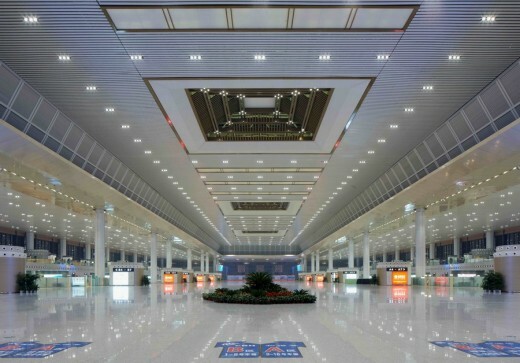 The project of Nanjing South Railway Station has features of large scale, magnificent momentum, long design period and urgent construction period, which has gone through several important revisions in the process of construction. The design team has always insisted on their initial design idea as well as respect and understanding for traditional culture and local contexts in the up to 5 years design process. Their constant efforts and persistence has facilitated the Nanjing South Railway Station to become another splendid reflection of the five characteristics principle including “functionality, systematicness, advancement, culture and economy” of railway passenger stations with the result that it has proudly stood in the new district of the ancient capital. We firmly believe that the modern buildings of the station with connotation of traditional cultures will uncover a new and young chapter for Nanjing and will also generate more profound influence on the city with the development and renaissance of the ancient capital. The design team has deeply understood urban history and cultural accumulation of Nanjing in the design process of Nanjing South Railway Station. We deeply felt that cultural sign of this ancient city was just preserved in several historical and cultural protection areas with limited areas in the nearly crazy high speed urbanization of China called demolishing old buildings and reconstructing new buildings in a large scale, what is more, Jiangning district, which is the location of project base, is a completely new modern urban district. Therefore, we firmly think inheritance and renaissance for history and culture are the best explanation for this ancient city at this milestone node of Nanjing’s another historic development. Though Nanjing South Railway Station has gone through several significant revisions in the construction process, the design team has always insisted on their pursuit for traditional cultures and regional characteristics and has also taken efforts to make it become a works with high completeness in this aspect. The design team has compared design schemes for every detail for many times until to find a satisfactory solution in all aspects in 4 years design process. We have also deliberated on the three-dimensional model and revised it for several times even for changes in the drawings deepened by cooperative organizations. We keep arguing strongly on just grounds with them for our original ideas for all design revisions generated by opinions of charging departments. Hardships of it made every designer have many emotions when looking back. We, with mission, hope to bring an eternal classical monument for Nanjing and also hope Nanjing will be more wonderful because of it. Central Design Group International (abbreviation as CDG) has been announced to transformed as institute since November 2013. Via years of development, CDG has become a strong team with fast growth and engaged in most of professional fields. Over the years, CDG has built up an outstanding design team with a large number of excellent architects and engineers specialized in various fields such as architectural design, urban planning and urban design. Over the 6 years since its establishment, CDG has devoted itself to providing good quality design services, thus enjoying a good reputation in the industry. CDG has also gradually developed its key corporate concept – “Architecture serves society”. Winner- Nanjing South Station Train Station Hubs by Chen Wu is Winner in Architecture, Building and Structure Design Category, 2014 – 2015.